Maureen Johnson has done it again in her spectacularly haunting follow up to The Name of the Star. 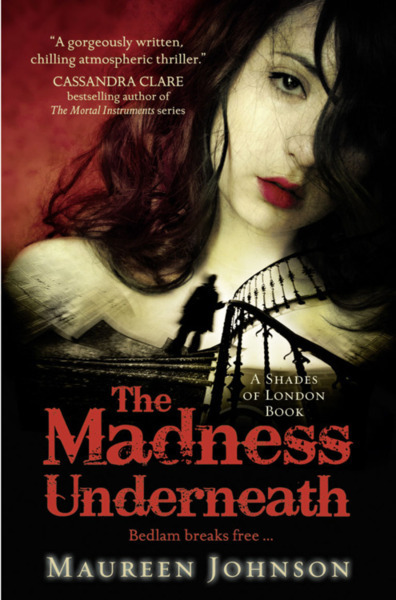 Rory is trying to convince her family and psychiatrist that she is perfectly fine, after surviving a near death experience at the hands of the Ripper killer (although she has to keep the fact that he was an insane ghost, and the news that she can now eliminate a spirit with a single touch, a secret). She’s desperately trying to return to some degree of normalcy, and finds herself back in London at boarding school with her old friends. Except while she’s managed to convince everyone around her that she’s moved on from the horrible attack, Rory can’t escape her newfound ability, or the aftereffects of surviving such trauma. I really appreciated Johnson’s articulation of how Rory wants to move forward, but slowly realizes her wit and carefree attitude can’t spare her the pain of going down the mundane road of emotional recovery. In many supernatural novels, dramatic catastrophes befall our heroines and it’s seldom that you get to read a sensitive exploration of how these experiences affect them. Rory also feels conflicted about using her new power to permanently extinguish ghosts, even though the Shades of London (the secret ghostbuster society) need her to help track down another paranormal threat. This time the unhinged spirit seems to be connected to the frightful history of Bedlam, England’s most notorious insane asylum. Again in this sequel, the spirits haunting modern-day London are brought to life with rich details, and historic connections that Johnson weaves through the plot. When you take a minute to think about all that’s happened in the last 2000+ years in the world, there’d have to be some disgruntled, violent spirits yearning for vengeance. As this case unravels, Rory falls in with a new group of people with ‘the sight’ who have a very different goal in mind from the Shades. Her relationship with Stephen grows more complicated, and her desire for a normal teenage existence is thrown in to question, as the strain of her double life begins to show. Johnson is a fearless writer who takes risks with her characters; she’s not afraid to torture her readers with an unthinkable twist. The end of The Madness Underneath feels like she’s offering you a fat slab of delicious cake, only to tell you the sinister ingredients as you swallow. Still, I can’t wait to gobble up whatever she has in store for me in the third book!